I've really enjoyed watching my beloved childhood shawarma become more popular and introduce new people to the spices and flavors of Middle Eastern cooking. And that popularity has bred fabulous variations. Once a seasoning for roasted meats served on a sandwich, it's now used to season beans, vegetables and anything else you can think of. I totally approve. And since I make large batches of shawarma seasoning and keep it in a jar in my cupboard, it's easy to reach for it when I'm testing recipes. Chicken meatballs are frequently in rotation on my dinner table but shawarma spice and a seasoned tomato sauce gave them a whole new flavor and another recipe for my dinner roster. Enjoy! Make the spice mixture by combining the cumin, coriander, garlic powder, cinnamon, turmeric, salt, and black pepper in a small bowl. You can make extra and keep in a covered jar along with your other spices. In a large bowl, mix together the chicken, small diced onion, minced garlic, egg, shawarma spice, salt, parsley, and breadcrumbs. Using a one-ounce scoop (approximately), scoop out meatballs onto a baking sheet lined with parchment paper. You should get about 24 meatballs. 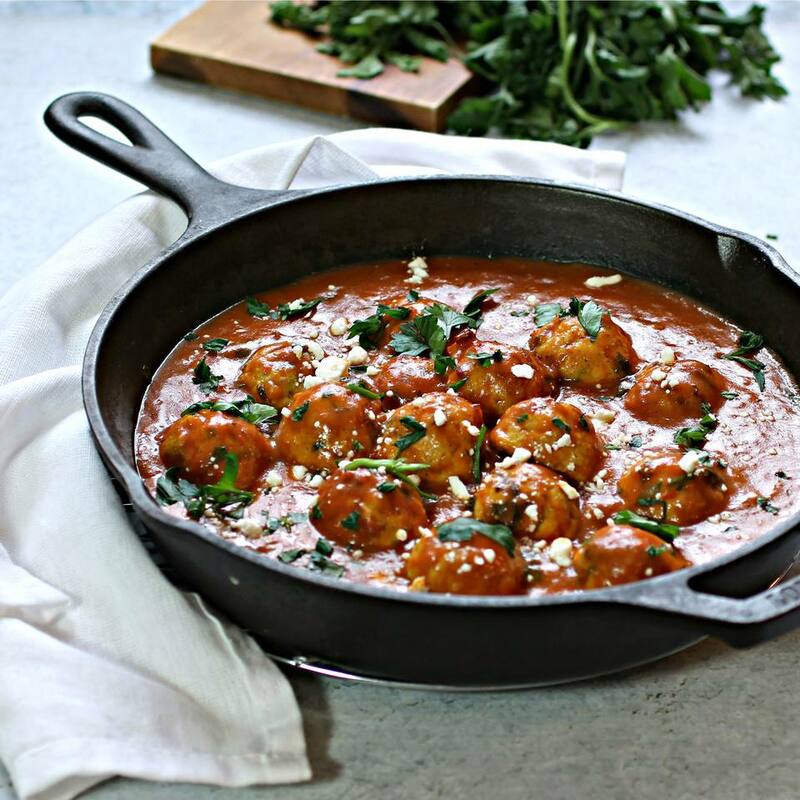 While the meatballs are cooking, make the sauce by adding one tablespoon of the olive oil and the diced onion to a large skillet. Saute for a few minutes until the onion becomes translucent. Add the remaining tablespoon of olive oil and whisk in the flour until combined. Then stir in the tomato paste and shawarma spice. Stir in the milk or yogurt and the chopped parsley. Season with additional salt if needed. When the meatballs are cooked, add them to the sauce and simmer for an additional 10 minutes. Add the crumbled feta cheese and serve warm.